My Dad likes to support the US Olympic fund and in return, "gifts" are frequently offered. One such incentive was a mesh tote bag. He offered the tote bag to my middle DD ... and as one can never have too many tote bags, she accepted. I offered to embroider her name on the top, so we picked out a font that she liked. The capital came from one of the freebies that Gosia had offered at one time. It's no longer a freebie, but is a VERY affordable design file. It is the Monogram 4 pack. Update: well, it would have been affordable, but apparently, it's no longer offered on the website. You might want to contact them to see if they still have it available, eventhough it's not shown. The lower case letters are from Zari's Embroidery Delights as a freebie alphabet. The file contains the upper case and lower case. Zari also has other freebies that are very nice. Update: Zari no longer has its own website but continues to offer its designs through Oregon Patchworks. Sadly, I couldn't find this alphabet among the designs displayed. This is one of those projects where I knew exactly how it should be stitched out but reality came out differently. Doncha just hate it when that happens? 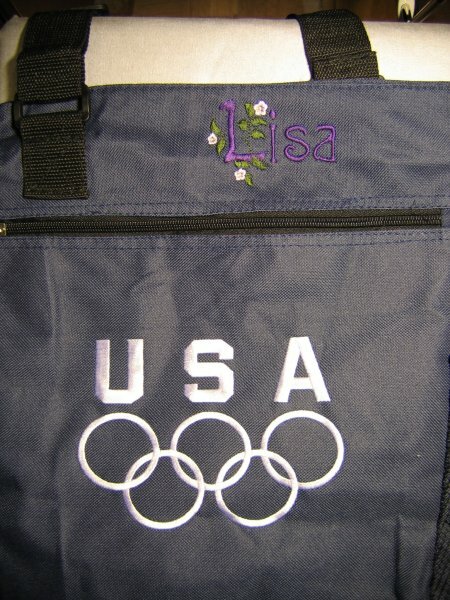 In this case, I had not engaged my brain before putting the embroidery machine in gear so that Lisa's name centered between the wrong placemarkers. AAAAAARRRRGGGHHHH! Boy, it looked so nice when it was stitching out. It wasn't until I looked at it from afar that I realized her name wasn't centered properly. [sigh] It'll just have to do.